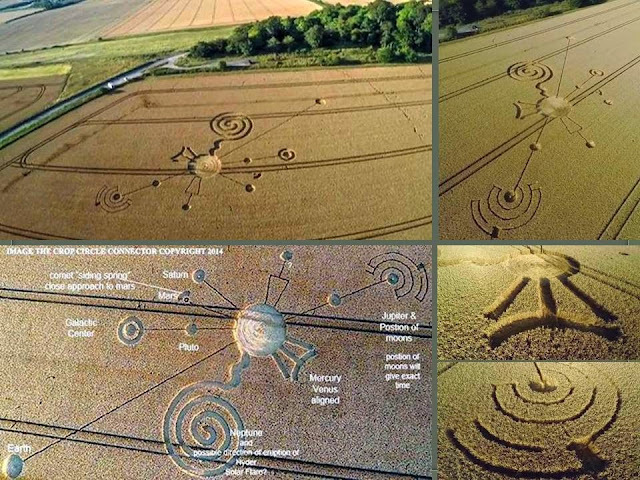 Aerial view of crop circles Roundvey, Wiltshire. Parkers Hill Plantation, Cherington, Gloucestershire, United Kingdom on 27 July. Green Street, Avebury, Wiltshire, UK on July 29. Raundvey Hill, Wiltshire, UK on 30 July. Especially the circle next to Roundvey Hill in Wiltshire is a strange and a lot of surprises. It shows the geocentric location of the planets, Mars, the Moon and the Sun in our solar system. Geometric work in the circle appears to be related to an unexpected astronomical event September 9 2014 What's going to happen in September, about trying to warn us, perhaps until it is too late?